If you’ve been watching the new season of HBO’s Insecure, then you recently saw high-powered corporate lawyer Molly accidentally discover that her white, male coworker, Travis, makes significantly more than she does. She mistakenly opened his paycheck (for $6,991.54!) and thought she suddenly got a big salary bump. Later, he confirmed that he’s been making that salary for quite some time. 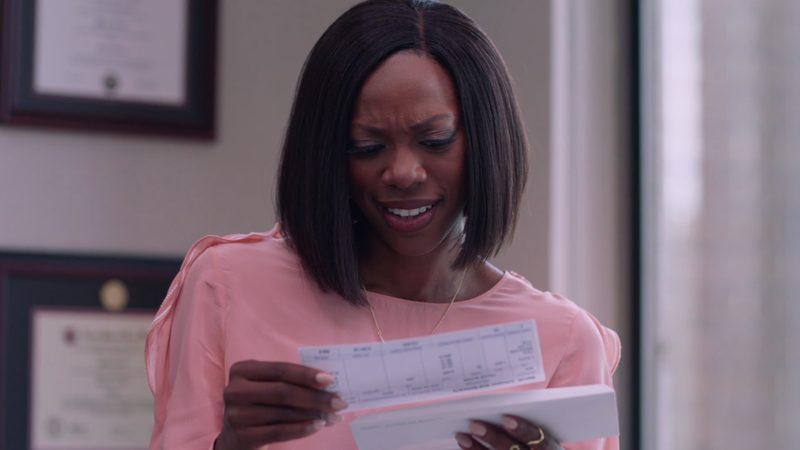 Molly reading her coworker’s paycheck. This story probably sounds familiar to a lot of women, and particularly women of color. It seems incredible that Molly, a highly-compensated attorney, could experience a pay disparity – after all, on the show Molly and Travis both have the same advanced degree and the same amount of experience. But women experience a gender wage gap in nearly every occupation (including attorneys at large law firms) when we compare all women to all men, and the wage gap is significantly wider when we compare women of color with white, non-Hispanic men. While women working full time, year-round typically are paid only 80 cents for every dollar paid to their male counterparts, Black women who work full time, year round are typically paid only 63 cents for every dollar paid to white, non-Hispanic men. Even in highly paid occupations like lawyers, engineers, and physicians, Black women still are paid only 64 cents for every dollar paid to white, non-Hispanic men in the same occupations. In fact, Black women experience a wage gap at every education level, in every state, and across occupations. The wage gap persists for many reasons, including overt discrimination, implicit bias, and stereotypes about women and women of color. Unfortunately, pay disparities and discrimination are difficult to uncover, because pay is cloaked in secrecy. That’s partly because of our cultural taboo against discussing salary information. But it’s also because many workplaces, either informally or through written policies, forbid employees from talking to each other about their pay, and penalize employees who do so. As a result, many women don’t know that they are being paid less than their male counterparts, and often find out by accident. Like Molly, they may inadvertently see a male coworker’s paycheck, or hire a subordinate and find out his salary will be higher than theirs. Pay secrecy helps hide race and gender pay disparities and discrimination, often for years. Just ask Lilly Ledbetter. We’re glad to see that in the last few years, more companies have taken steps to close their gender and race wage gaps, and increase transparency around their compensation practices. Some companies claim to have eliminated gender and race wage gaps in their workplace, and we hope it’s true. But very few companies are explaining how they did it, or whether they’re taking steps not only to correct existing disparities, but to make sure they don’t recur in the future. Without more information, it’s hard to evaluate their claims. Collecting pay data from large companies through the EEO-1 pay data collection, to shine a light on gender and racial wage gaps and help the agencies responsible for enforcing equal pay laws detect pay discrimination. But the pay data collection is under attack from Congress and the Trump Administration. Strengthening our equal pay laws through legislation like thePaycheck Fairness Act and the Pay Equity for All Act, so that women are better able to uncover pay discrimination — including by discussing their pay with coworkers — and fight back. Lifting up the wages of women in low-wage jobs by raising the minimum wageand ensuring that tipped workers receive at least the regular minimum wage before tips, through legislation like the Raise the Wage Act. Building ladders to better paying jobs for women by removing barriers to entry into male-dominated fields. Increasing access to high-quality, affordablechild care. Helping to prevent and remedy caregiver discrimination, and protecting workers from pregnancy discrimination with legislation like the Pregnant Workers Fairness Act. Providing paid family and medical leave and paid sick days. Ensuring women’s access to the affordable reproductive health care they need. Protecting workers’ ability to collectively bargain. Establishing fair scheduling practicesthat allow employees to meet their caregiving responsibilities and other obligations, with legislation like the Schedules That Work Act. You can make a difference by joining us today for a Twitter storm at 2 pm ET to raise our voices and demand action to achieve #BlackWomensEqualPay!